Small possession squares will be coned off 12x12 yards. Each square will have four balls on the outside. There will be one player in each square who will be the defender. Blue players will keep possession of a ball until it goes out of play or the defender wins possession. Play continues until all four balls have been won or gone out of play. A blue player will then swap in as the next defender until all players have been the defender. Two possession square will be set up big enough or small enough to accomodate the numbers for the session. In between will be a dead zone with ten footballs. Play starts with the blue team keeping possession of a football in their square. If the ball goes out of the square or is won by a red player then the three red defenders sprint to their own side and collect a football on the way to begin the possession on the other side. At the same time three blue defenders enter the opposite square and attempt to win the ball back. Defenders rotate turns each time. 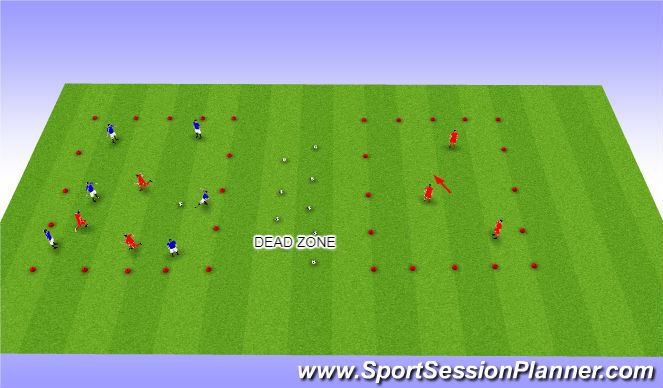 The play swithces backwards and forwards between each square until there are no balls left in the dead zone. Balls are then collected by both sides and the play starts again. 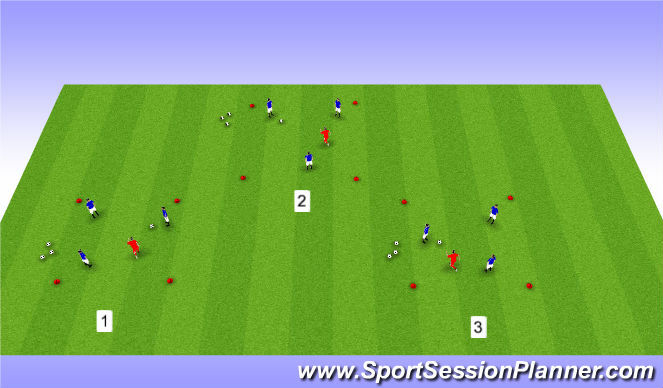 Progressions: Limit each player to two touches, reduce the number of defenders to two each time.